While it's possible to ingest your daily intake of vitamins through a diverse diet, supplements are recommended for a healthy baby and pregnancy. Folic acid, iron and calcium are just a few of the vitamins women should take prior to, during, and after their pregnancy. When pregnant, your body supplies 100 percent of the nutrients for another human being. Pretty neat, huh? While your body is doing all that work, it only makes sense that you'll need more nutrients than usual. While the nutrients from food are more easily absorbed than those from a pill, most doctors recommend prenatal vitamins to ensure there isn't any gaps in both the mom and baby's nutrition. But what should you take and when should you take them? 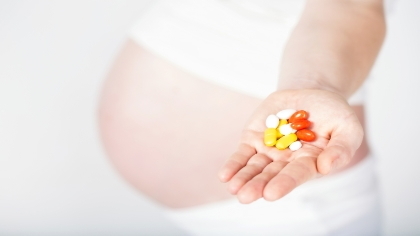 Here's what you need to know about prenatal vitamins. The best time to start taking prenatal vitamins is before you get pregnant. Prenatal vitamins are not just for when you're pregnant—they are also beneficial before and after pregnancy. Many doctors will recommend starting prenatal vitamins about three months before conception. Of course that's not always possible, in which case it's usually best to start taking prenatal vitamins as soon as you discover you're expecting. Physicians usually recommend continuing to take vitamins for six weeks after your little one arrives, or for as long as you continue to nurse if you are breastfeeding. There are two ways to get prenatal vitamins: through a prescription or over the counter. A doctor may base your prescription (if you choose to get one) on your medical history or blood work -- for example, if tests show an iron deficiency you will need more iron. Prescription prenatal vitamins are known for being large and hard to swallow for some. Over-the-counter vitamins are typically smaller and most still have a good balance of nutrients. However, prescription vitamins typically have more folic acid (which is especially good for the baby, as discussed below). Prenatal vitamins are designed to help meet the nutrient needs of both mom and baby. These vitamins contain the nutrients that are important not just for the baby, but for you as well. When you are getting prenatal vitamins over the counter, be sure to check that it includes each of the following ingredients. Folic Acid is arguably the most important nutrient for babies, as numerous studies have shown that it can help prevent neural tube birth defects. Most neural tube defects happen very early in the pregnancy, often before the pregnancy is discovered, which is why women who are trying to conceive should take folic acid. Prescription prenatal vitamins typically have 1,000 micrograms (mcg), while the over-the-counter variety can have anywhere from 400 to 800 mcg. Natural food sources of folic acid include leafy greens like spinach, turnip greens and several varieties of beans like pinto and garbanzo. Iron intake for a pregnant woman is three times the recommended intake for the average person. At least 17 milligrams (mg) a day is recommended in a prenatal vitamin. The body uses iron to carry oxygen throughout the body, so a lack of iron can make you feel tired—and since simply being pregnant can make you feel tired, it's a good idea to make sure you're getting enough. Never take more than the recommended dose of iron, since it is possible to consume too much. Food sources of iron include spinach and beans, chicken, beef and iron-fortified cereals. Calcium is used by the body to build bones, so it only makes sense that women who are building a tiny person need extra calcium. Remarkably enough, a woman's body becomes more efficient at absorbing calcium when pregnant. But since most women don't consume enough calcium in the first place, it's a good element to have within a prenatal vitamin. Most health care professionals recommend 1200 mg a day for pregnant women. Dairy products are high in calcium, along with spinach and calcium-fortified juices. Additional nutrients like Vitamin D and B12 are also included in prenatal vitamins. WebMD recommends taking vitamins that along with folic acid have iron, calcium, vitamin D (400 international units, IU), vitamin C (70 mg), thiamine (3 mg), riboflavin (2 mg), Niacin (20 mg), vitamin B12 (6 mcg), vitamin E (10 mg) and zinc (15 mg). Prenatal vitamins are not without side effects, however. Constipation and nausea, which are common side effects of simply being pregnant, can be emphasized by vitamin supplements. Eat plenty of high-fiber foods for your first meal of the day and take your vitamins with the second meal of the day. Prenatal vitamins, especially prescription ones, can be quite large, making them difficult to take if you experience a lot of pregnancy-related nausea. If you have a hard time taking your vitamins, ask your doctor about an alternative -- it may be possible to use a liquid supplement. Some companies also make over-the-counter gummy vitamins for pregnant women, but pick up an iron supplement if you go that route since gummy vitamins don't include iron. As always, if you are unsure about your vitamin intake, talk to your doctor. If a product isn't marked specifically as a prenatal vitamin, be sure to talk to a medical professional before taking it, as some supplements and medications are not safe for infants in utero. Never take more than the recommended dose, as it may more harmful than helpful.